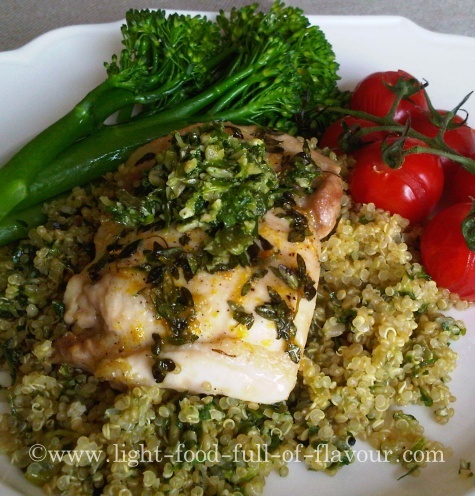 I’m serving the chicken with quinoa mixed with a super-fresh and utterly tasty mint and parsley pesto. I love experimenting with different ingredients for pesto. As I aim to make my food healthy as well as tasty, I’ve added crunchy pumpkin and sunflower seeds - along with a lot of other tasty and healthy ingredients - to this one. These seeds are rich in essential fats and full of other super-healthy nutrients. I eat a fair amount of seeds and nuts every day. To make this lemon and garlic chicken dish ultra-good for you, I also serve it with oven-roasted tomatoes and steamed tenderstem broccoli (broccolini) – a cross between kale and broccoli. 1. Start by mixing together the lemon zest, garlic, lemon thyme and oil. Cover an oven-safe dish with baking parchment and place the chicken thighs flat on the tray. Smother the chicken with the marinade. Cover the dish and place it in the fridge for at least 30 minutes - longer if you’ve got the time. 2. Pre-heat the oven to 200C/fan180C/400F/gas mark 6. Put the vegetable stock in a pot and heat to boiling. Season the lemon and garlic chicken with salt and pepper and place the dish in the oven. Cook for about 18 - 20 minutes - until the chicken is completely cooked through. Add tomatoes to the dish for the last 8 minutes. 3. While the chicken is cooking, add the quinoa to the boiling stock, stir and then lower the heat to a simmer. Cook for 15 minutes, drain in a colander before tipping the quinoa back into the pot. 4. Make the pesto while the quinoa is cooking. Place all the ingredients in a food processor and pulse for about 10 -15 seconds. Add the pesto to the cooked and drained quinoa and mix together. 5. 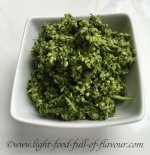 Steam or boil the tenderstem broccoli for about 3 minutes.